There are two types of people in this world: those with ice dispenser fridge/freezers, and those without. As a member of the without group, I have spent countless hours over my life pouring water into trays, spilling half of it trying to find a level surface in the freezer, and patiently waiting for thermodynamics to do its magic. I have tried the shortcut of going to the store and buying bags of ice bigger than my son (surprisingly expensive). So much time and effort all for the enjoyment of a chilled drink. That is when I heard about ice makers; said to be an automated, cost-effective way of making ice. After reaching out to my restaurateur friend and doing some research of my own I bought an Opal Nugget machine which I have been using for the last couple months. The verdict? Exaggeration aside, ice is now always available and I never have to mess with mold trays and extortionate store-bought bags. If you are looking to join the club, here are 2 of the best ice makers on the market right now. Dimensions (LWH) 14" x 9.5" x 12.9"
Costway’s slogan, "cost less all the way! ", is exemplified by their countertop ice maker that shares almost identical features and with its counterparts but with a significantly smaller price tag. Being electric-powered (100W), it is both quiet and efficient. Standard cycles are between 6 to 13 minutes long with each one producing 9 bullet-shaped cubes. To turn on the machine we head to the control panel sporting a grand total of two buttons - one for power and the other for selecting the cube size (small or large). 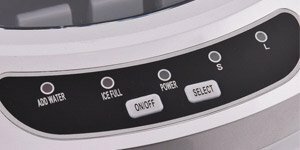 The five indicators light up to tell you everything you need to know including when to add water, the current mode, and when the bin needs emptying. One gripe we have is that the storage bin only has a 1.5 lb capacity. With 1.1 lbs being made every hour, it has to be emptied several times a day if you want to leave it running for extended periods. Weight. 17.5 lbs is reasonably light for a machine of this quality, meaning you can buckle it up in the backseat and bring it along to parties. Thanks to being made from ABS plastic, the exterior is able to have those curves without sacrificing strength and durability. The control panel has a black background which is a strong contrast to the rest of the machine but luckily is small enough to avoid being in the way. Ice can be accessed by opening a transparent top lid means you don’t even need to touch it to view inside. Also available in silver (pictured), white, black or red; each with an awesome glossy finish to lively up your man cave. For a mid-range ice maker with the ability to serve all the glasses you throw at it, we struggled to find a better option than this. It doesn’t mess around with remote controls or time scheduling. It doesn’t send push notifications when full. It just makes damn good ice. Dimensions (LWH) 15.5" x 10.5" x 17.2"
Crowdfunding is responsible for bringing countless product ideas into existence. Some live up to their hype and go on to be successful businesses, others fizzle and die. FirstBuild’s ice maker is one of the success stories, raising well over 100% of their funding target and being a best seller in this category ever since. The ice is what sets them apart from the rest. Unlike the kind you get from filling up a tray and putting it in the freezer, this machine produces nugget ice, a crunchier, softer, slower to melt, and generally higher-end product. Similar to the commercial-grade machines, it has a rapid turn around with the first cube being made in just 15 minutes of operation. Since it produces 1 pound of ice per hour and the bin can hold only 3 pounds at any given time, it will reach max capacity in 3 hours (nearly 3 times longer than the mid-range maker above). But rather than overflowing, a sensor instructs the machine to stop and wait. As nuggets melt inside the insulated bin, water trickles into the reservoir and is reused in the next cycle. Alternatively, you can scoop it out and store it in your freezer or fill up a tub for a midday ice bath (hey, even athletes do it). A handy addition is the Bluetooth connectivity using the FirstBuild app. On top of knowing its current status and getting notified when it is filled, you can schedule it to turn on/off specific times. The first thing to note is the stainless steel shell with a scratched/worn texture. Definitely a step up from the plastic used by nearly every other manufacturer. Having the storage bin door be both transparent and front-facing is its biggest selling point. Rather than hiding what it does, the purpose of the machine is made the centerpiece. Since the dashboard and scheduling controls are found in the app, it can get away with a single button on the front used to turn it on/off. How do you know if it is turned on without looking at the app? An LED surrounding the button will light up. Simple. 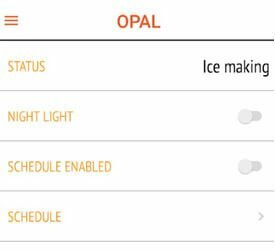 Opal offers a commercial-grade experience for everyday consumers. If you can get past the price and realize that ice nuggets are worth their weight in gold, then this is for you. Fast production times, restaurant-quality ice, remote scheduling; putting an ice tray in your freezer will feel like going back to the Middle Ages. And remember: quality in = quality out. Always use the best water you have available. Tap water may be easily accessible but the taste will transfer to your drink. See Current Price What do you do when you can’t keep up with the amount of ice being made? Have an ice bath? Throw it out? Instead, buy a pack of 100 ultra-durable plastic bags with cotton drawstrings to help store up to five scoops of ice each! Keep them in your freezer, sell them on the side of the road, or simply give them away to bricklayers sweltering under the sun. Just like water bottles which haven’t been cleaned in a year, the inside of your machine will start to grow mildew and mold if left alone. It won’t be as bad as leaving, say, a coffee machine untouched for a year, but that is no reason to avoid a quarterly task of wiping it down. Simply pull the plug from the wall, empty the water storage and all remaining ice, wait until the main compartment defrosts, spray each part with a non-toxic cleaner (preferably organic), dip a cloth in warm water, and start wiping all the nooks and crannies. We recommend waiting a few minutes before wiping it again with a new cloth dipped in cold water to get rid of residual cleaner fluid (no one wants to taste that in their drink). Now celebrate with a refreshing whiskey on the rocks!